Road Crew In Belize Destroys Ancient Pyramid : The Two-Way Only a small core of the 2,300-year-old Mayan structure remains after earth-moving equipment destroyed the rest, archaeologists say. What's left of the Nohmul pyramid after a construction crew virtually destroyed the 2,300-year-old Mayan structure. 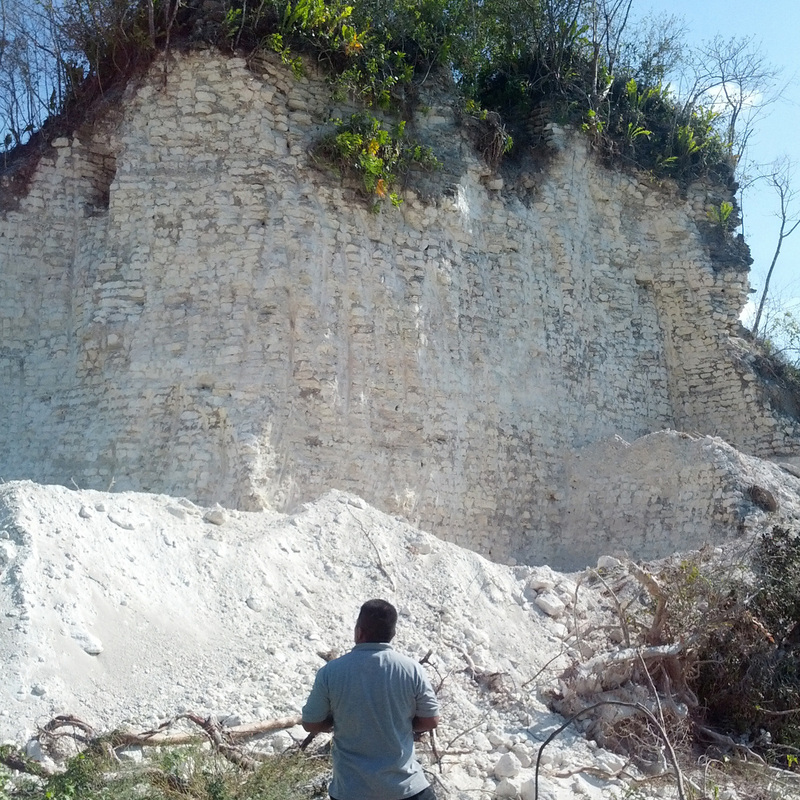 A construction crew in search of gravel to use as road filler used its backhoes to level one of Belize's largest Mayan pyramids. "It's a feeling of incredible disbelief because of the ignorance and the insensitivity ... they were using this for road fill," Jaime Awe, the head of the Belize Institute of Archaeology, said of the destruction at the 2,300-year-old Nohmul pyramid, located in the Orange Walk/Corozal area. "It's like being punched in the stomach. It's just so horrendous," Awe said Monday of the destruction thought to have occurred last week. "There is absolutely no way that they would not know that these are Maya mounds," John Moore, also of the Belize Institute, said. The BBC says only a "small core" of the pyramid was left standing. It said prosecutors were considering criminal charges against the construction company. Awe noted the ironic tragedy that the swift destruction of the pyramid with modern equipment came after "ancient Maya acquired all this building material to erect these buildings, using nothing more than stone tools ... and carried this material on their heads." "... one structure was partially demolished to provide road material for the San Pablo to Douglas highway. At least three burial chambers were uncovered during its demolition and while some of the contents were recovered by the authorities, most were either smashed or looted."